So what’s better than a free app? 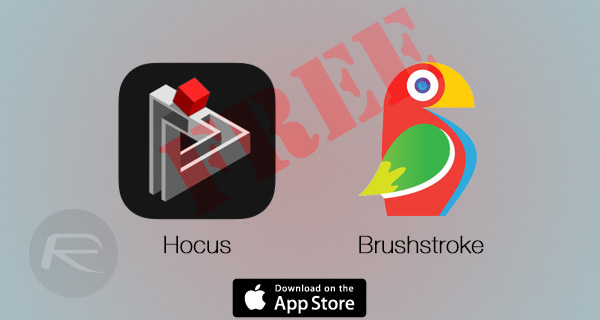 Two free apps! We have the rare chance of doubling up Apple’s Free App of the Week offer this week with a second free iOS app offering from the Cupertino-giant. You should be looking at a total saving of $6 combined for both the apps: a beautiful puzzler, and and a powerful photo editing app. The first of the two apps is called Hocus. It’s a mind-bending puzzle game which usually costs $1 from the App Store but can be grabbed for free right now till next Thursday as part of Apple’s Free App of the Week offer. As for the second free app, it’s a photo editing app called Brushstroke. This app usually costs $5 on the App Store but can be grabbed through the Apple Store app for free for limited time. Coming back to Hocus, for those who are into puzzle games, Hocus is the perfect minimalistic title to keep you occupied and your brain cells revving. The game relies on structures that present an optical illusion to the gamer with the aim of flipping a tiny box into its desired position. Hocus presents no hurry, and the background music makes sure that you stay calm with its slow and psychedelic score. From a ‘perspective’ of keeping yourself occupied when bored or say commuting to work, Hocus is well worth the $1 it usually retails for, but lucky us, it can be downloaded for free till next Thursday from the App Store. Moving on to the Brushstroke app, this app “transforms your album photos and snaps into beautiful paintings in one touch.” Given the recent surge in users for the Prisma app these days, Brushstroke is likely to inspire you into giving your photos a slightly more – dare I say – realistic painting effect, with some tweaks to go along with it. How to grab Brushstroke for free? As mentioned earlier, make sure you have the Apple Store app installed on your iPhone and iPad, and just follow the quick instructions below to get up and running with Brushstroke app in no time. 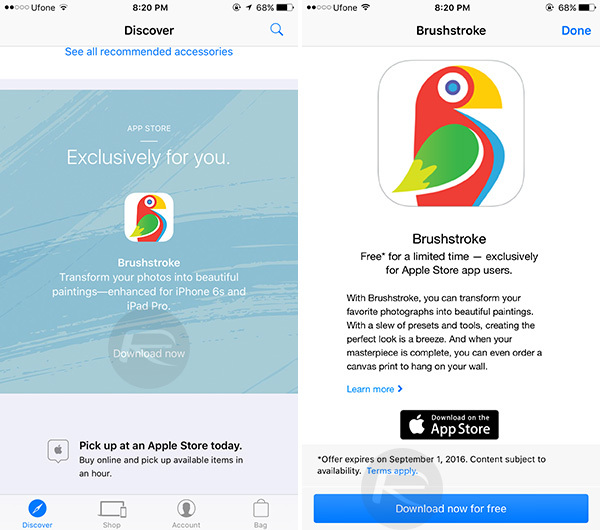 Step 1: Launch the Apple Store app and scroll down below till you find the promotional section for Brushstroke. Here, tap the Download now button followed by tapping the blue Download now for free button on the next screen. Step 2: This should move you to the App Store. 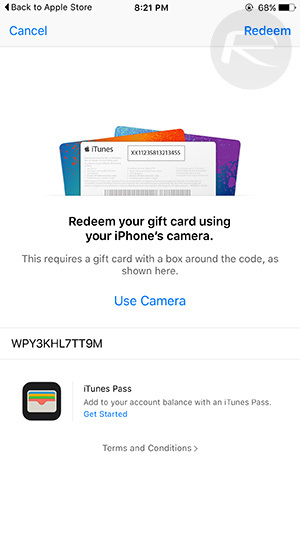 Now simply hit the Redeem button in the top right corner of the screen and then follow the on-screen instructions to proceed with the download of the app from the App Store for free. That’s it. Enjoy the $6 saving!